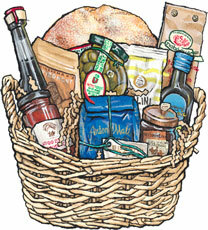 Tuscan's Treat Italian Food Gift Basket for sale. Buy online at Zingerman's Mail Order. Gourmet Gifts. Food Gifts. A glowing reminder of Italy, it arrives, unnannounced, like a handsome vacation daydream. Includes Zingerman’s Paesano Bread, Zingerman’s Travel Olive Oil, Vecchia Dispensa’s Aged Balsamic Vinegar, Antonio Mattei’s Original Tuscan Biscotti, Italian Slow Dried Pasta, Italian Tomato Sauce from Il Mongetto, Roasted Hazelnuts from the Piedmont, Taralli Olive Oil Crackers, Chestnut Honey, and Leccino Black Olives.